This mod adds heart items that are dropped by all mobs on death (1.3+), if the player that kills the mob doesn't have full health (1.4+, configurable in 1.7+). 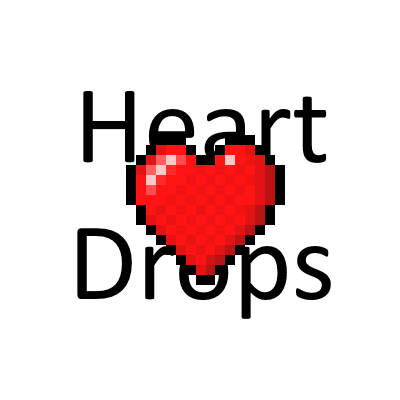 More hearts can be dropped with higher looting levels (2.0.5.1+). The hearts can be picked up by the player to regain a heart of health, though the item never appears in your inventory, as it is deleted as soon as it is picked up. There is a 1 in 45 chance to drop a golden heart instead of one of the red ones, which will add 1 absorption heart and the chance can be decreased with looting levels (2.0.8.1+). (2.0.5.1+) Mobs will drop 1 heart unless the mob implements IDropHearts, then they will be customizable by the mob creator. This mod can be included in any modpack that downloads its' mods from Curse without explicit permission, such as the packs downloaded on the Twitch launcher. If the modpack does not download mods from Curse for each user, then you do not have permission to include this mod. This mod is very much inspired by the heart items from Terraria that work in the same way. The reason for "1.0.7.0" being that and not "1.7.0.0" like the others is because I messed up the ordering on the previous version names. It's not a mistake, it's not an error. I just wanted to fix the version names sooner rather than later. If you really like my mods, you can donate to me on Ko-fi or Patreon. If you can't donate, that's completely fine. Just downloading the mod, adding it to a Twitch pack or playing a Twitch pack that includes it, is enough support. Thank you for this awesome plugin. I love it ! The config is almost empty, there are not so many config. Like drop rate. Wait, I misunderstood the mod. I though you would get 1 max health more, not regen an heart. I'm working on making a more expansive config, but I'm not really sure what to add, but once I have things to add, I need to add the options and then fit the changes into this file. I do mention that this mod works nearly exactly like how the dropped hearts work in Terraria, and the description does say, in the introduction, that the hearts are picked up to regain a heart. add a % drop chance with different amounts for passive, hostile, and boss. also a suggestion, add a rare golden heart that will give 30 seconds of absorption. Could have asked me to add them rather than just telling me to... And you didn't need to reply to me, could have just started your own comment. The different drop chance is a good idea, I'll implement it and config options when I next get time. It is possible to have a range of hearts drop already, but the default for vanilla mobs is always 1. I don't want to change how much the heart heals, as it's a single heart that's dropped, it heals a single heart. Simple. I've thought about adding different kinds of hearts. Half hearts have been suggested, and I think golden hearts have also already been suggested, but then I could expand it to an Iron Chests kind of thing; iron heart, copper heart, etc. And that seems more like an addon. The mod crashes for me when I kill a mob with an arrow. I left the crash log in the issue tracker. Thanks for reporting this, I'll take a look why this is happening and try to get a patch out soon. I can add a config for the range of hearts that can be dropped. As for the scaling option, it's a solid feature and I'll definitely implement it! I apologize for a late reply, I've been a little busy. I didn't think that anyone was interested in this mod or including it in a pack. But if you have any more ideas for features, feel free to suggest them, and I'll credit you if I implement them! Being able to set the features above individual for each mob, basically an override for that mob. I've implemented a few of your suggestions, such as the looting scaling and an API for other mods to use (I adapted your "special mobs" idea). I haven't implemented the health scaling, but I can look into it now that I've fixed a duplication bug. As for the special heart, I wasn't sure if I should just implement a "golden" or "crystal" heart, or if I should go the Iron Chests route and have a heart for each tier. Thank you for your suggestions, I apologize for taking so long to do anything about them. I will port it back, but I have a few more features that I want to implement before I start to branch out to multiple versions. It can become an annoyance to have to keep maintaining multiple versions of a mod, so only the latest will continue to be supported. This mod would come in handy while battling my way through a roguelike dungeon early on. Would it be possible to backport this to 1.11.2?